What this expat does next will completely blow your mind! Or perhaps it will just leave you scratching your head. Faithful readers will recall that I’ve suffered “serial expat angst,” also known as Dante’s Fifth Circle of Hell (for the sullen), since late January. Running, the wisdom of Bruce Lee and compulsively reading books about North Korea, have all eased the anxiety caused by gaping into an unknown future. You see, I had spent at least half a year under the assumption that we would be moving to Shanghai this summer. As such, I giddily re-applied myself to studying Mandarin Chinese, searched out bi-lingual schools for my young expat kids and asked lots of questions of other expats about neighborhoods, daily expenses, housing, transportation, etc. And then one midwinter day, my partner suggested that, for sensible work- and air pollution-related reasons, we consider an alternative move. I spent the winter mulling this idea over, frankly unhappy with the changed itinerary. I eventually swallowed the pill of this new future and started afresh on my expat relocation research. But climbing out of Dante’s Fifth Circle of Hell (for the sullen), I stalled at Dante’s First Circle of Hell (for those in limbo). Even though I excepted the probable reality of our next move, the move itself remained a work-related uncertainty for my partner until May. Finally, when the next country itself was a secure decision, for a host of logistical, quality of life, school and cost reasons my partner and I remained uncertain about which city to live in. So after much dithering and gnashing of teeth, I am pleased to (finally) announce that we are moving to the city of Utrecht in The Netherlands. The packers come in three weeks. I will ‘summer’ in America, before taking up residence in Utrecht in August. After which, I will be cycling, boating the canals, soaking up the city’s mix of medieval charm and modernist edge, learning what some might call a ’boutique language,’ and nosing around for part-time work. Between now and then, however, I am scrambling to enjoy every bit of Hong Kong and China that I can possibly squeeze in. If you have something lovely to share about The Netherlands or Utrecht, please chime in! If, however, you were once robbed in a dark alley on the outskirts of Utrecht by a man wearing a Miffy mask on a rainy night after eating your fourteenth meal in a row consisting of meat, potatoes and bread, reminisce in private. That will be quite a change! Sounds like fun. Always game for something new! (But will miss ‘greater’ China terribly. Ooodles of bloggers and twitter-fiends in the Netherlands, so at least you have plenty of people to connect with … hopefully IRL as well as online. And you can get great deals on flights around Europe, so think of all the travel opportunities! 🙂 I’m sure you’ll love it once you settle in. Yes, as always, I’m sure I’ll come to love it (just as I’ve come to love every place we’ve lived)! But from my current vantage, getting from the goodbyes in Hong Kong to the new friends and routines in Utrecht, feels like a sad repetitive chore! AHH!! I know exactly the same feeling… trying to prepare for one country and then ending up in another instead! I did that with Denmark/Greenland, except i had two days to decide and then I flew off in three weeks! I actually don’t talk very much about why we move around! Funny, right? Well the easy story is that my husband’s job pulls us around (frankly would have stayed in Hong Kong longer if it made work-sense). The more complicated story is that we really enjoy China, and we also really enjoy charming smaller European cities, hence the ping-pong back and forth between continents. Yeh i had a read around and couldn’t really find an explanation. If it is Not too nosy to ask, what does your husbond do, and what do you do then? My husband works for an international company that designs and makes consumer products (he’s an engineer by training). I’m a lawyer who worked for a great NGO until part-way through our time in Cambridge (when kids and time zones made it unworkable for me). Since then I’ve been parenting/writing/studying, and am interested in finding part time work once we’re settled in Utrecht. What a change! 🙂 Good luck with this new phase…! Thanks! Should be interesting. How is Mexico lately? Still dreaming of char siu? Thanks! And when are you also relocating further west? Going for a week next week, then hopefully for good in September! Wow that’s a big leap. Best of luck packing – and not getting mugged by any strange men once you get there! Thanks! It will be time to pull out the sweaters again. Now this IS news!!! The Netherlands will be fab, it’s a perfect base in Europe. Just imagine all the travelling you can do from there 🙂 And you’ll have decent cheese again! Tulips! Pancakes! Great Indonesian food! Oh, yes! I’d nearly forgotten the Indonesian food! Thanks very much! There is much to look forward to. Oh wow – how exciting! Just imaging all the things you can’t do in Hong Kong… biking, eating proper Italian ice cream, dining out on the street, walking on the sidewalk without bumping into the people… it will be fun! Save travels Jen! Thanks Ruth! While I really hate to say goodbye (the next few weeks are going to be rough!) there is much to look forward to! Congratulations for relocating to the Netherlands. Please continue blogging your experiences and insights from there. Certainly! Will be on the look out for the odd, interesting and new. Yes, far too soon to leave Hong Kong, but needs must. How are you doing? Have been thinking about you and wondering! Sad you’re leaving but excited for your new adventure! Waiting past the due date is the worst! Been there… My sympathies! Good luck! It’s only taken me since February to crawl out 😉 . And while I accept our decision, with 2.5 weeks left in Hong Kong, I’m in deep good-bye-mode sadness. Perhaps the worst I’ve experienced. Doesn’t seem to get easier with practice. But yes, chocolate, cheese, cycling, blue skies, clean air, cool art scene, historic charm, canals, etc all sound rather idyllic! Will embrace it fully come late August! Ha I love your “upworthy” style title! If I hadn’t been accepted into Nintendo, I would have gone to Utrecht university to do my masters in linguistics. I sometimes wish that I had gone down that route. I can’t wait for your stories and photos! Glad someone noticed that! (Everyone else probably just thinks I’ve gone a bit mad!). Oh, studying linguistics would have been fascinating. All these different paths… always interesting to ponder these decision points! Thank you for sharing your insights for the past few years. It is always interesting reading your unique perspectives/observations about the city I regard as a second home town. NL should be a nice change of pace after the hectic environment of HK and Chinese cities life (even Amsterdam seems laid-back to me compare to HK.) I ‘d think it won’t take you much effort adjusting to the new place as I thought you spent some time in Groningen before? I wish you good luck on your next leg of your expat journey and looking forward to you next post from the land of tulips. You have a keen memory! Yes, we spent 4 months living in Groningen back in 2005, so I do have some taste of the Dutch life. The city of Utrecht should be rather nice and I am certainly looking forward to cycling everywhere. Thanks very much for the good wishes! While I’m looking to the future with optimism, saying goodbye (yet again) is very, very hard. My condolences on not coming to Shanghai, we might have been able to have a few adventures together! Think of the bread and cheese you will have, and the distinct lack of pork floss available! (these are about the only good things I can come up with. I get depressed when I think about leaving China myself). Godspeed and have a safe move! I am broken-hearted both over leaving Hong Kong and over not moving to Shanghai. Thanks for the good wishes. Despite my reservations, vow to jump into Dutch life with both feet! Turnaround for the books! But I’m so glad you now have some certainty to work with, and looking forward to the new “lingo”. Thanks very much for the blog tip! And yes, it’s a turnaround that’s left me with a bit of whiplash. Suspect I may end up spending those idle first weeks bumming around the Chinatown area of Utretcht while I adjust. Thanks for the encouraging words! I am now (mostly) looking forward to the change! Still, you should take advantage of all of that good regional Chinese food while you’re in the area, so hop on up to Shenzhen and 狼吞虎咽. Does it count if I grabbed McDonalds french fries I my way back from the Dafen Art Village in Shenzhen? Probably not. I am ashamed. Sounds wonderful! I would love to live somewhere where it’s convenient (and safe) to bike everywhere. I am truly looking forward to the safe, city cycling! I really enjoyed it the three years we lived in Cambridge UK. Just picked up this post. Bummer – life in HK will surely be less interesting, scratch that, more miserable, without your blog company! But glad for you to move to a place with better air, among others. Hope you’ll keep up blogging so that we get to experience your adventures voraciously! All the best!!! Thanks for your good wishes. Leaving Hong Kong is a drag, but never fear, I will keep on blogging! Well enjoy the clean air, biking, and Oranj. In order to fit in, just stock up on hunter safety orange at your local Ranch & Home in the states. We spent our Spring Break in Zeeland. It was so lovely. Another nice thing about the Netherlands, they have the BBC on TV with Dutch subtitles. Oh the BBC with Dutch subtitles is one I hadn’t thought about! (Or the hunter’s orange for bike safety). Thanks! I just learned I have a colleague in Utretcht! And the Netherlands in the World Cup! Hurrah! Does Utretcht have a Chinatown? Come to Utrecht and help me find the Chinatown! There is no sign of it on the web, but there must be a couple Asian grocery stores someplace. And as for my newly adopted football team: suppose I’d better pull out an orange t-shirt Wednesday. 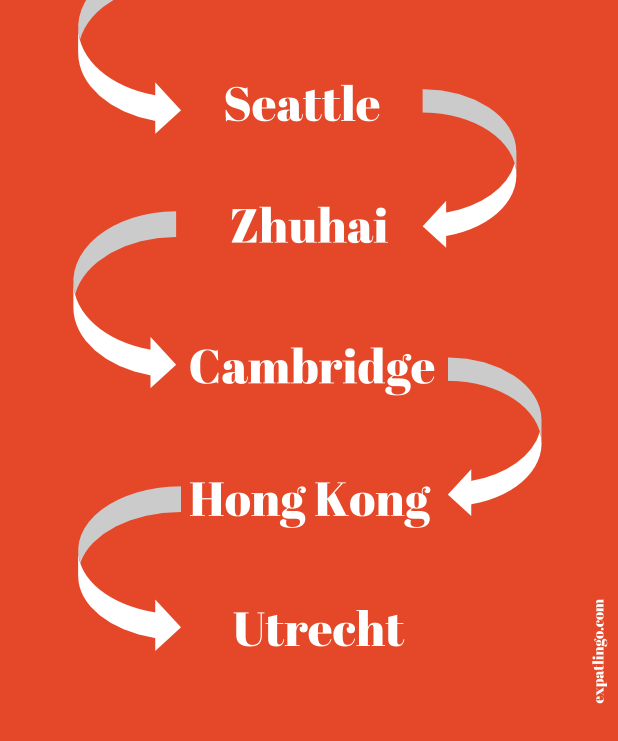 Yes, like others have said, your lungs will thank you for Utrecht over Shanghai. Hey, didn’t they sign some treaty over there in Utrecht? And what treaties have heralded from Shanghai? Nada. Except for the Dim Sum Edict of 1872, which stated you cannot tackle the server pushing the little push carts full of egg tarts, no matter how much she’s ignoring you. Don’t forget to email me when you’ve a free moment in Seattle. Will be here all of July and August. Clever lady to remember the Treaty of Utrecht. As for the Dim Sum Edict of 1872, has it also become applicable in Hong Kong under the Basic Law since handover in 1997? Based on experience, seems likely.